The idea to recognize remarkable examples of historic preservation of Riverton homes with an award in honor of Daniel Campbell originated with former HSR President Mr. Gerald Weaber, and this meeting now bears the fruit of his research efforts last year. HSR President Mrs. Phyllis Rodgers called the meeting to order and a short requisite business portion of the meeting included various announcements as well as a customarily thorough treasurer’s report by Paul Daly, our own esteemed CPA on the job. Phyllis introduced Paul W. Schopp and congratulated him on his recent (March 5) designation by Riverton Borough Council as Borough Historian. Mrs. Rodgers noted Mr. Schopp’s vast knowledge of local history as well as contributing his invaluable expertise to the Society to past projects. Paul has certainly been my go-to guy for fact-checking stories and getting hard-to-find resources during my tenure as editor of the Gaslight News. Our former HSR President, Gerald Weaber, concurs saying, “No one else comes close to his encyclopedic knowledge of all things Riverton. At the meeting Mrs. JoAnn DiNoia, Porch Club President, and Phyllis Rodgers displayed the Porch Club’s new sign, a cooperative project of the HSR and The Porch Club. The sign was erected at a later date near the Club’s entrance. Mrs. Rodgers then turned attention to our honored guest, former Riverton resident, Mr. Daniel T. Campbell, AIA. A distinguished past president of the Historical Society of Riverton and editor of the Gaslight News, Daniel Campbell is a Historic Architect widely recognized for his experience in restoration and preservation of historic architecture. Citing his past preservation projects and honors, she explained “…it is therefore fitting” that the new HSR Preservation Award be named for him. Read more about Dan Campbell here and see more details about the award named in his honor here. Then matters moved on to the main event – the presentation of five 2014 Daniel Campbell Preservation Award certificates and crystal diamond paperweights etched with the Society logo. At the meeting we heard from Dr. and Mrs. Horn, Helen Hughes, John Laverty, and Michael Spinelli as they recounted the pleasures and pitfalls of renovating an old house. Ummm… I think I saw that movie before. 200 year-old farmhouse only to meet a long litany of unforeseen troubles and setbacks. But these Riverton characters had studied their parts and each story had a happy ending, resulting in homes absolutely transformed from their former states. 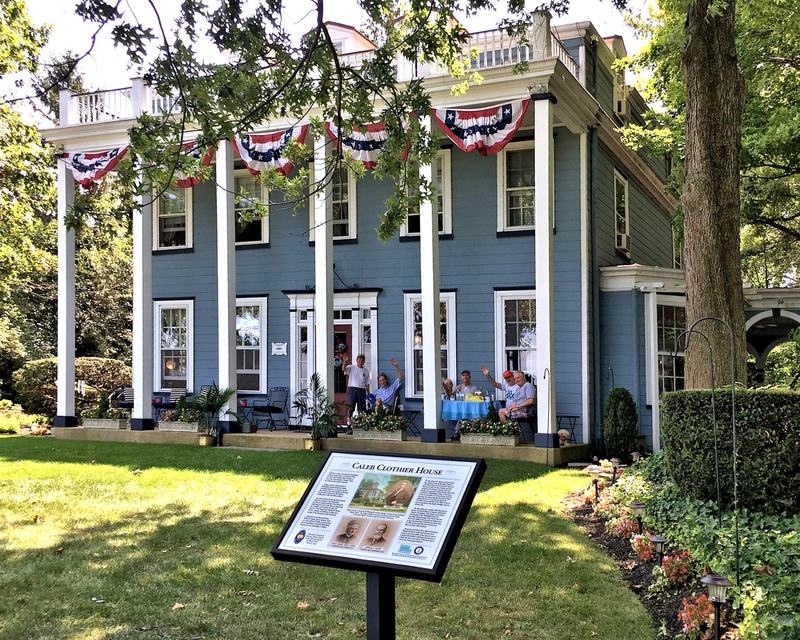 Check out the continuing saga of Helen Hughes’ renovation of the Biddle Mansion at 207 Bank Ave., and another about John Laverty’s home at 616 Main. Here’s a few more snaps from the meeting.